Florence is one of the world's great cultural centers. Although it is often listed as a port of call in cruise brochures, it is an inland city and the ships actually dock a significant distance away, typically in Livorno. Thus, guests wishing to visit Florence have to spend part of their day traveling between Florence and the ship. This raises the question: how much of Florence's cultural treasures can a cruise traveler see during a port call? To answer this question, I signed up for a shore excursion to Florence that promised a guided tour of the city's historic district plus some “free time” during which the guests could do what they liked before re-boarding the coach for the trip back to the ship. There is too much to see in Florence to see in just one visit. Indeed, you could spend an entire day viewing the Uffizi Gallery's great art collection. However, as discussed below, I was able to glimpse the majority of the city's historic public buildings, piazzas and great churches. 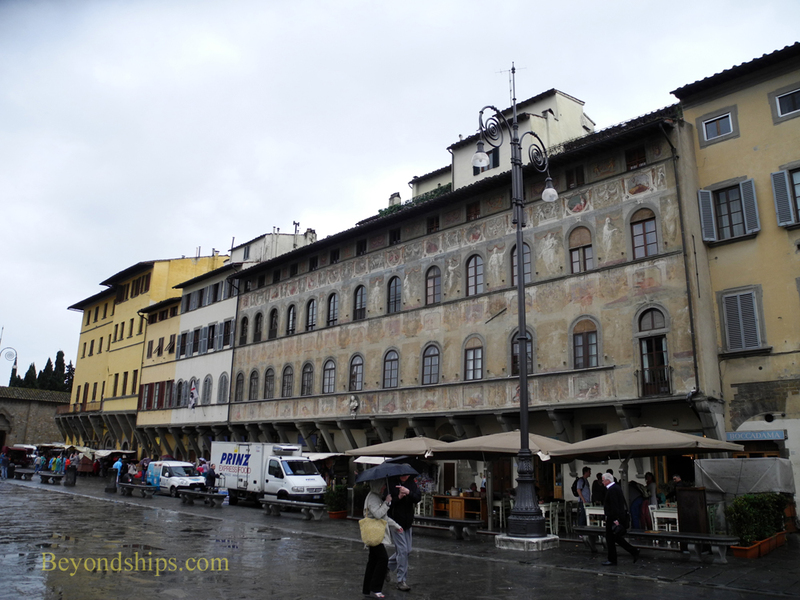 Most of the attractions of Florence are close together in a historic district that straddles the River Arno. The majority of this area is pedestrian-only but automobiles do intrude around the edges. Visitors arriving by coach are often dropped off at a point east of the historic district that is near a watch tower on the north bank of the Arno. Train travelers arrive at the station near the Piazza Santa Maria Novella to the northwest of the district. Since ours was a coach tour, we set out on foot from the watch tower. The streets of historic Florence tend to be narrow and dark. Its historic buildings are mostly medieval and heavy. It does not have the lightness and romantic appeal of its great rival Venice. Florence is sometimes called the “birthplace of the Renaissance.” However, it is not immediately apparent why these somber surroundings should have fostered a rebirth of thought. Florence, an independent city-state, was nominally a republic in those days. However, it was effectively ruled throughout this period by one family - - the Medici. Eventually, the pretense of just being citizens of a republic was disposed of and the Medici rulers became the Dukes of Florence and later, when Florence acquired more territory, Grand Dukes of Tuscany. Unlike other European ruling families who came from a warrior background, the Medici had their roots in commerce. They first became prominent in the wool trade but later made a vast fortune as bankers. Members of the family became popes and through marriage, their descendents became monarchs of France, Spain and Austria. Of more relevance is the fact that over time the majority of the people in Florence were employed by the Medici. While it was not a very enlightened political system, Medici rule did result in a flourishing of the arts and sciences. The family acquired a massive art collection. Moreover, they commissioned works from and patronized contemporary artists such as Michelangelo, Leonardo Da Vinci, Donatello, and Fra Angelico. They also patronized scientists such as Galileo. This flow of financial resources created an atmosphere in which artists and scientists could think and create. 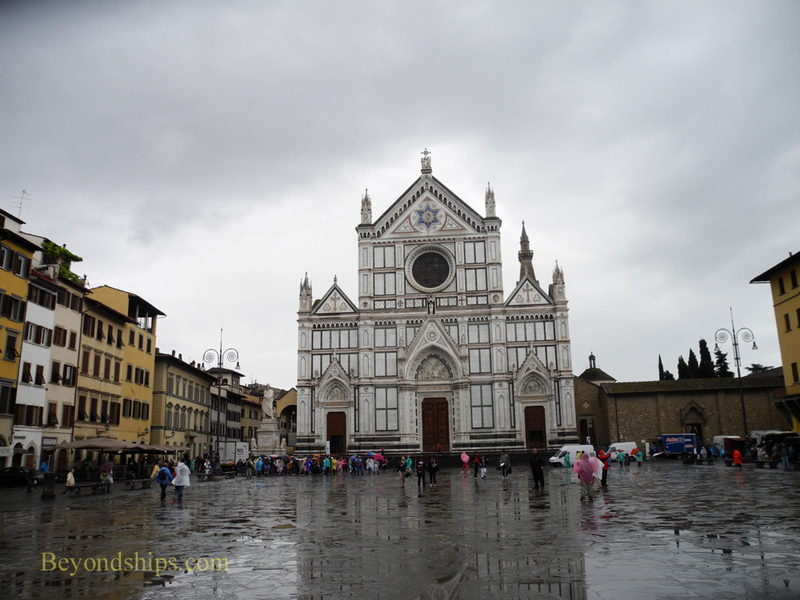 The first important area we came to was the Piazza Santa Croce. 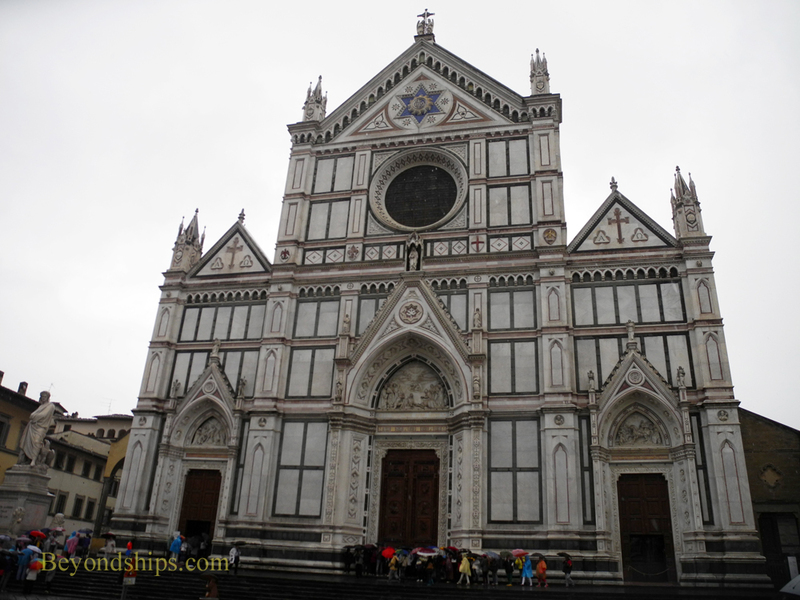 Its church, Basilica di Santa Croce, dates from 1294 and contains the final resting places of Michelangelo, Machiavelli, Rossini and Galileo. (Dante's tomb is reportedly empty). The church has art work by Giotto and Donatello. The multi-colored marble facade was added in the 19th Century. Above: The wide expanse of the square is used each year for a soccer game played in medieval costumes. Below: On the southern side of the square is the medieval Palazzo dell'Antella with its elaborated painted (and unfortunately faded) facade. Moving towards the center of the historic area, we came upon the first major art museum, the Bargello. Built in 1255, the Bargello is one of the oldest public buildings in Florence. 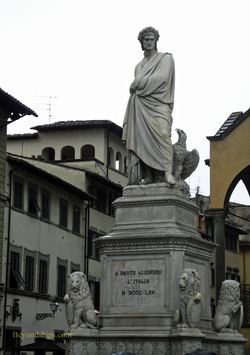 Art works include statues by Michelangelo and Donatello. 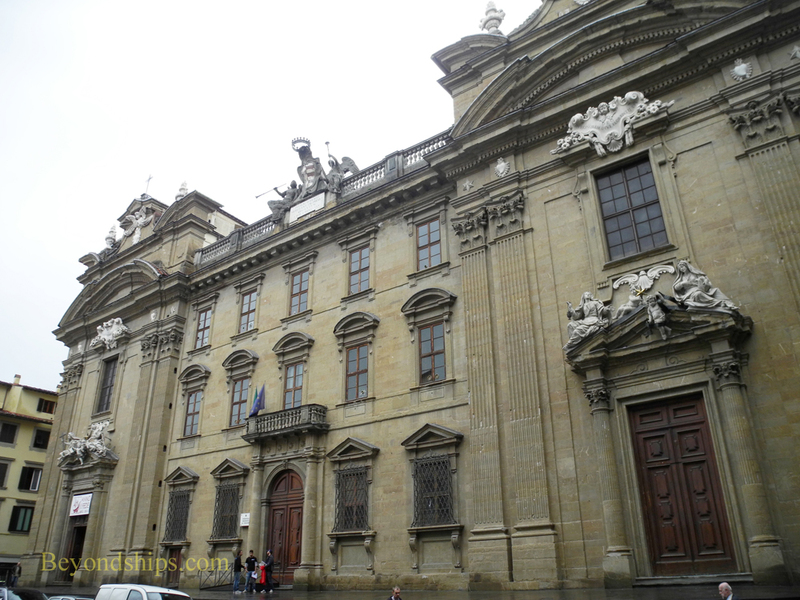 Nearby is the Complesso di San Firence, one of the few Baroque buildings in Florence (left). Originally built for religious purposes, most of the building is taken up by law courts today.